The final round of the Formula Division was marred by appalling weather – strong wind and heavy rain, and 3 of the matches were cancelled after they had started. 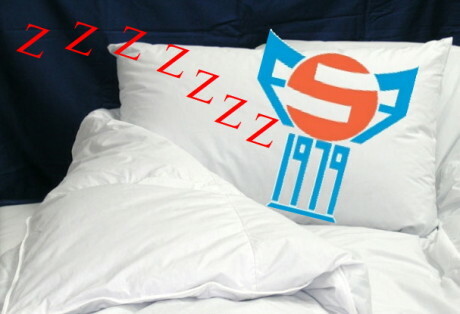 Only B36 Tórshavn against B68 Toftir and NSÍ Runavík against Skála were played to the end. It’s not clear at the moment what will happen with the cancelled matches, if they will be played later or not. As the results of the matches that were cancelled will not have any influence on the final table, the Football Association is leaning mostly to just leave it as is. But they were going to investigate the laws before they would take that decision, however. What was planned to be a festive end of season with free-flowing attacking football between no. 1 and 2 quickly washed away in the rain and wind on the við Margáir football ground this afternoon. In those 25 minutes the match lasted, it was HB who had the (very strong) wind behind them and therefore all the pressure was against the EB/Streymur-goal. Especially corners were dangerous, but EB/Streymur survived the scares. Once, Páll Mohr Joensen let fly from 35 metres, but the shot was just over the bar. But EB/Streymur also created chances, even if they had the wind against. Bárður Olsen was played through, but clear with the goalkeeper, Olsen effort went over the crossbar when he should have scored. Later, EB/Streymur went close again when Bárður Olsen moved the ball forward, combined well with his team mates, but in the end Arnbjørn Hansen? failed to get a proper shot in. But after about 25 minutes, the referee said enough was enough and stopped the match. It was simply not possible to play. As mentioned above, it’s not decided what will happen with the match. The coaches from both teams said they were mostly interested in leaving it as is and to register the result as 0-0. That’s also what the Football Association likes best, but they will have to check if the rules allow it before they make the final decision. B36 could drop from 3rd to 4th if they didn´t beat B68 if NSÍ at the same time beat Skála. And that looked to be happening, but 2 minutes into stoppage time, Róaldur Jacobsen scored the winner for B36. B68 were leading at half time with an early goal from Jann Ingi Petersen. B68 were leading at half time with an early goal from Jann Ingi Petersen. (Tróndur Vatnhamar had replaced usual goalkeeper Meinhardt Joensen in the B36-goal today). But 17 year old Róaldur Jacobsen restored parity midway through the second half before he with a flat shot from the edge of the penalty area scored his second of the day. The 17 year old has been playing sensationally throughout the season in B36´s midfield. Today´s goals were his first in the Formula Division. Photo above: B36 in white colours threatening late in the second half after a corner. NSÍ were on the verge of securing the bronze medals, but lost out in the end as B36 scored in stoppage time against B68. Einar Hansen put NSÍ in front in the first half while Bogi Løkin made it 2-0 with a direct free kick in the second half. Hopefully the Football Association will make a quick decision on what will happen with the cancelled matches. Hopefully tomorrow… But it could take longer. - We’ll post it here as soon as we know! The Football Association has still not made any decision regarding the cancelled matches. Still no news on the cancelled matches. It’s taking an awful lot of time making that decision whether to play the matches or not. More than a week has now gone, but it almost seems like the Football Association in hurrying slowly in purpose. As if they try to delay the decision so that they can say now: "Well, we have come several days into November now and, as everyone can see, the weather doesn’t permit football this time of the year. - Therefore we’ll just have to say that the cancelled matches will not be re-played!" It has been said that those matches that remain will not have any influence on the table, and therefore they can just as well be cancelled. Well, that’s not quite true, however. Because mathematically, HB Tórshavn, who are in 2nd place, can still drop to 3rd place if they lose enough against EB/Streymur. For that to happen, however, HB would need to lose by 27 goals! And of course that will not happen. But the question is if the match not per principle should be played as long as there is a mathematical possibility for B36 taking runners up position. Football Association takes its time to make a decision what to do with the cancelled matches. The Football Association has finally woken up from its bewitched sleep and has made a decision on what to do with the 3 abandoned matches in the 27th and final round of the Formula Division. And the decision is that the matches will not be replayed, but the result will be recorded as a 0-0 draw, and the teams will get a point each on the table (the result of the matches when they were called off was fortunately 0-0 in all 3 matches). 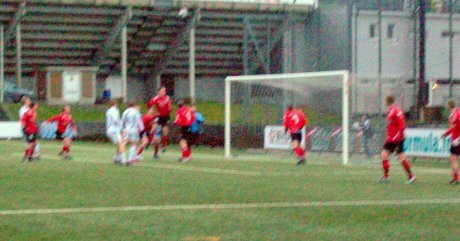 The 3 matches were EB/Streymur vs. HB Tórshavn; Víkingur vs. KÍ Klaksvík and ÍF Fuglafjørður vs. B71 Sandoy. ÍF vs. B71 was called off after about 10 minutes while the other two were called off after approximately half an hour. 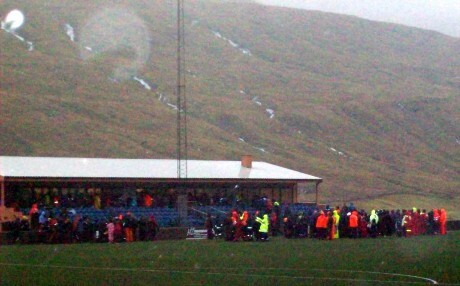 The two other matches, B36 Tórshavn vs. B68 Toftir (2-1) and NSÍ Runavík vs. Skála (2-0), were played to the end although the weather in those two matches was appalling. The FA says, among other things, that because the matches would have no influence on the final placing in the table, this was the most sensible thing to do (also because the clubs weren’t interested in playing these matches now). But anyway, the 2008 league is now officially over. You can see the final table in the Formuladeildin / Formula Division here.